For Ian and I, Sundays mornings are the best mornings of the week, we wake up with no schedule, we take our time to enjoy our coffee, enjoy the morning listening to music, wearing our pajamas and our biggest plan is: whats for breakfast-brunch?. 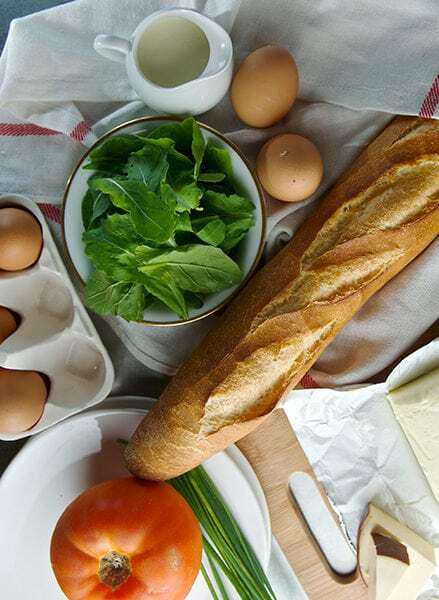 We love eggs in any shape, color, form, or cooking method, my favorite eggs are poached or baked in ramekins with cream where you can dip the crusty baguette into the yolk- creamy goodness ah!….Eureka! That’s when it hit me. 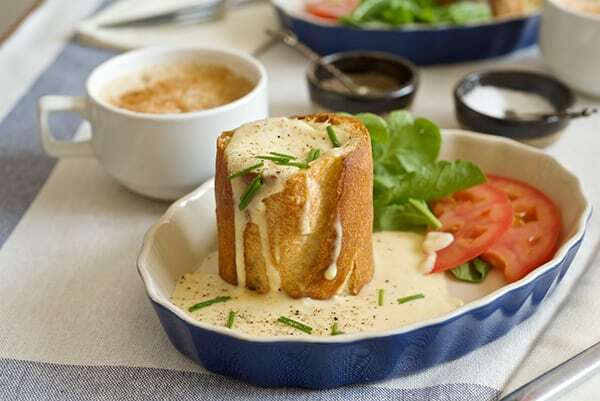 Why not omit the ramekins, and cook the egg into the baguette? That’s when the “Baguegg” conquest started. We picked up the bread on sunday morning, I cut them into cylinders, remove some of the inners, spread some butter and cream inside, crack the egg and there you have it, the perfect vessel for your egg. At the beginning I was worried about the crust becoming more like a crouton! But when they come out of the oven they where perfect. 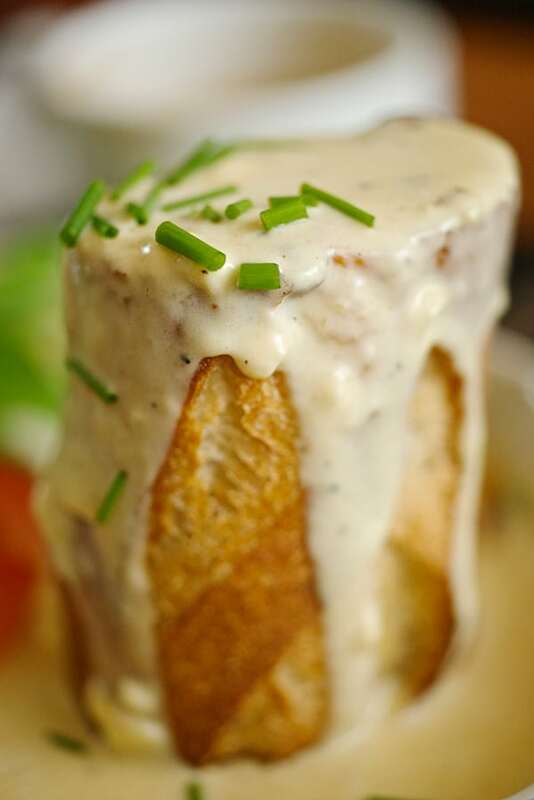 The egg and cream add the right moisture inside out so the baguette does not over crunch-iffy. The egg cooks perfectly with runny egg yolk and custardy egg whites. And to top it all off , I made a cheesy sauce with smoked gouda… Talk about indulgence…. We always eat as healthy as we possibly can during the week and save our cravings for Sunday morning. So why not indulge a little?…….After all, it is finally Sunday and life is short so enjoy the ride! Can it be Sunday soon, please? Serves 4 or 2 hungry brunchers. 1 Baguette Traditional, crusty good, artisanal quality. 2 tablespoons of heavy cream. 1/4 cup of whole milk if needed to adjust the thickness of the sauce. 1 to 1 1/2 cup Stout beer, Guinness will be best. Cut the baguette into 4 pieces around 4”/ 20 cm. long and remove ¾ of the inners being careful to leave some inner bread in the bottom so the egg does not escape. 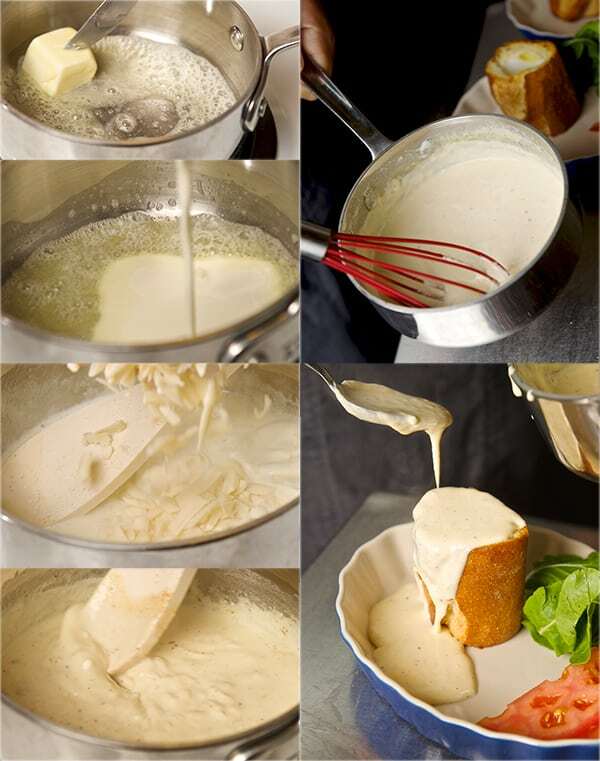 Brush the inside of the baguette pieces with heavy cream and spread with a ½ tablespoon of butter. Place the baguette cylinders standing up on a baking tray lined with some parchment paper. 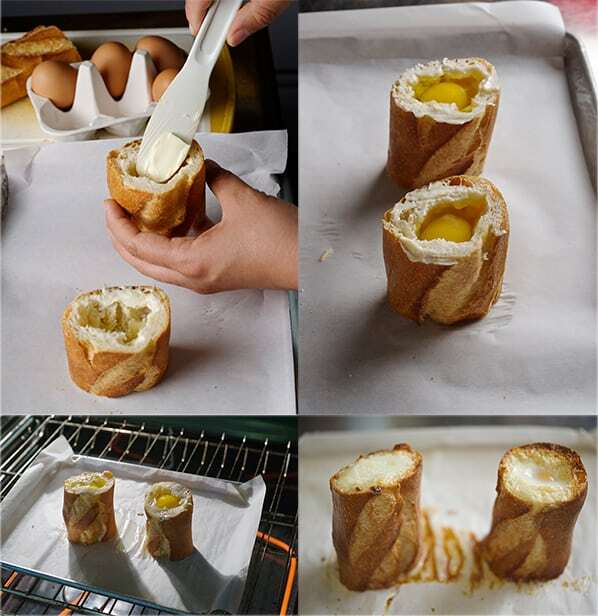 Crack 1 egg inside of each baguette cylinder. While the bagueggs are in the oven, prepare the cheese sauce. In a small saucepan heat the milk, heavy cream, butter and cajun powder until you see small bubbles on the edge of the pan, add the cheese little by little stirring slowly until all cheese is incorporated. bring down the heat to the lowest. Add pepper, salt and pepper , if it is to thick you can add a little bit of milk stir until well combined and creamy velvety consistency. Keep sauce warm on the lowest heat and stir often to avoid a skin on the top of the sauce. Remove tray from oven and using a flat spatula or tongs to transfer them to the plate. 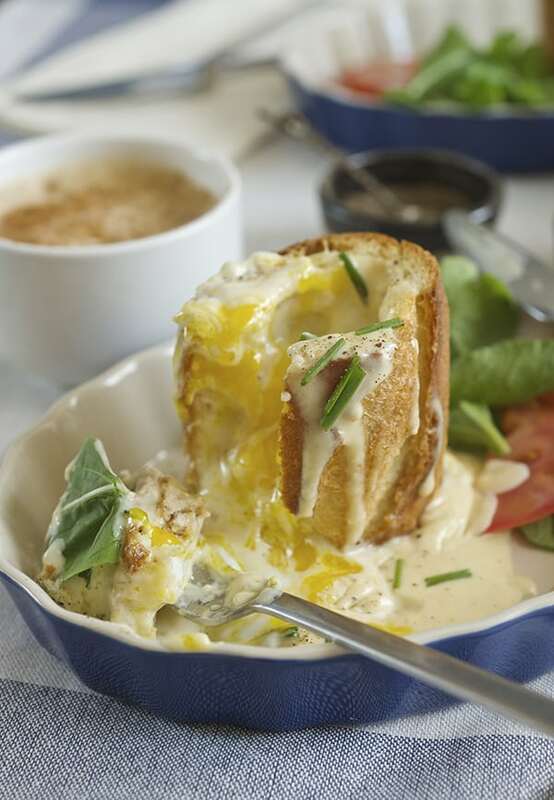 Serve each baguegg with a generous 2-3 ladles of the warm cheese sauce. Sprinkle with chives, and a few crancks of black pepper.